Pick the attractive color that blends into your kitchen. 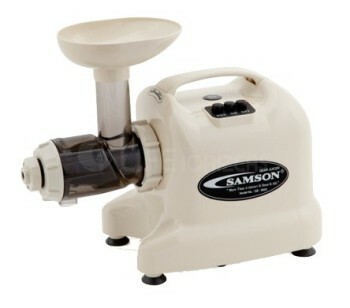 The Samson Advanced juicer is available in Almond, Black, Chrome-colored, and White. From Ellen P of New York, New York on 1/25/2018 . From Anonymous of Franklin, Wisconsin on 8/31/2017 . The Samson Advanced Juicer has worked out well for me. Putting the machine together is very simple as well as dismantling the parts. Clean up is very easy as stated. I have been happy with making ice cream & juicing, especially wheat grass. The label with the Samson name falls off the machine & will not adhere to the machine. I would have liked the label to adhere as I like the looks of it on the machine & would like to promote your product to anyone coming into my home. From Anonymous of New York, New York on 7/10/2017 . Recommended for wheatgrass and does a fantastic job. From Anonymous of Orlando, Florida on 2/11/2017 . From Anonymous of DOYLESTOWN, Pennsylvania on 1/15/2017 . I ORDERED AND RECEIVED PROMPTLY. COMMUNICATION WAS EXCELLENT. If yes, where can I see Samson link or note of confirmation? Response From Healthnut Samson A&B Health Wholesale: The front end where the juice is processed is BPA-Free. 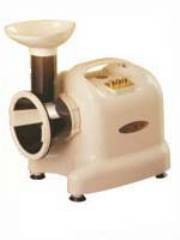 2/5/2015 – I am looking to purchase a juicer with an oil press attachment. They seem to have been discontinued. When will it be available . . .
9/5/2014 – How much do the cups hold under the juicer (in litres)? Can I use my own cups and if so what is the height of the space underneath . . .
6/24/2013 – I want to juice a good volume of pineapple. What can I expect from this juicer? Response From Healthnut Samson A&B Health Wholesale: Pineapple is very fibrous and is difficult to juice in many juicers without proper preparation. The FruitStar juicer has been reported to do a good job on pineapple. If that is your primary produce source, you might want to look at that unit. 6/23/2013 – What are the effects of using different nozzle number settings on my Samson advanced juicer/ When should I use '0' and when . . .